Who knew the Disney Fairies would be such a hit? Of course, Peter Pan has always been popular; as a play, a book, a musical, many movies, and ultimately a franchise. Disney alone has done a ton with this classic story, from TV shows to movie spinoffs. But none of their projects have succeeded quite as well as the Pixie Hollow Fairies. It’s not just Tinker Bell that captures audiences, it’s the entire world that Disney has created. Regions, climates, talents, jobs, leaders; Pixie Hollow is a self-contained fantasy world where anything can happen. So it’s not hard to understand why one movie was a success; what surprises me is just how big the idea became, just how many movies they were able to make out of one character. 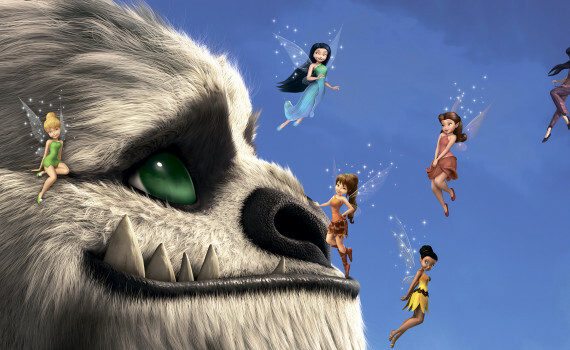 Tinker Bell (2008), The Lost Treasure (2009), The Great Fairy Rescue (2010), Secret of the Wings (2012), The Pirate Fairy (2014), and now NeverBeast (2014). A lot of movies for a short period of time. And as a father of a 5-year-old girl, I’ve seen them all. This is the second Fairy movie that isn’t centered completely on Tinker Bell. It introduces us to a brand new fairy with a little-discussed talent. Nix is a scout-talent fairy, a protector of Pixie Hollow and one tough chick. Her job is to keep the land safe, and when she hears strange noises in the forest she doesn’t hesitate to investigate. Meanwhile, Fawn, an animal-talent, is keeping a secret. She’s found a very unusual, very large creature whose purpose isn’t exactly clear. He’s collecting stones, building towers, and seems to be connected to a odd storm that is gathering & preparing to strike the region. Nix is confident that the monster is harmful and that she needs to capture it, while Fawn sees it as just another animal who needs her help. A standoff is in the making, with the fate of Pixie Hollow hanging in the balance. I’ve enjoyed every Pixie Hollow Fairy movie I’ve seen so far, with The Great Fairy Rescue being my favorite. It features humans, with their frailties and shortcomings, which makes it a bit more than just a fantasy story. NeverBeast does no such thing, and after Pirate Fairy, is a return to original format; an adventure on the island of Neverland where the fairies must work together to solve a problem. But this time Tink wasn’t the main character, the whimsy of the other films was missing, there wasn’t much catchy music, and the whole story fell a little flat. Fawn has never been my favorite character, and so I didn’t like her leading all the action. The other fairies were almost non-existent, and so was any plot except for her bonding with the creature while Nix tried to capture it. This might be the weakest of the franchise so far, though still a fun kid’s film that doesn’t require much from audiences other than that they sit back & enjoy.